7.29 points at 17 votes (rank 259). Except for the new level design, there are no further differences to the original game Crillion. 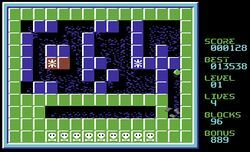 With the help of the joystick a ball is controlled, that can be recoloured over colour blocks and as in Breakout resolve stones of the same colour. Furthermore there are pushable stones that pose unwanted obstacles and skull fields that cost a life. Already the first levels have a relatively high difficulty level and without strategy probably no level can be solved. Wall Here the ball bounces off. Ball The constantly hopping ball. Block If the ball touches a block of the same colour it will dissolve. Colour changer When touching it, the ball picks up its colour. Slider If the ball touches a slider of the same colour, it will be moved one field further. Skull Every touch costs a life. Dissolve all coloured blocks, then the next level will come up. 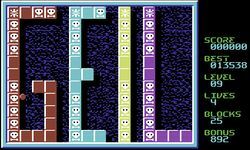 After losing a life, the current level needs to be repeated. The faster you finish a level, the higher is the time bonus. When all 25 levels haven been done successfully, you get into a random mode. 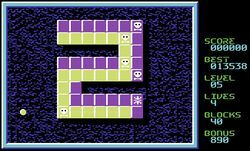 Here one of the 25 levels is chosen until the player has lost all his lives. H.T.W: "As already with the original Crillion there is a high addiction and fun factor, according to: "I'll try once again, I can make it". 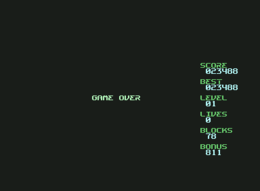 However, already level 1 is relatively hard, that is why this version of Crillion can only be recommended to players, who not right away bite into the joystick...". 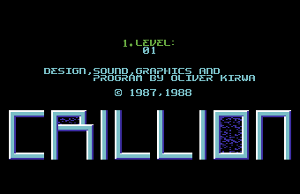 Camailleon: "This is actually the "New Crillion 1" that I know from the earlier days and which I played often and with joy. 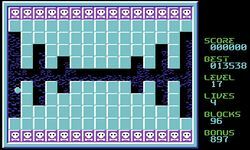 Concerning the difficult level I would put Crillion '93 on the same level as Crillion. Both have their tricky hurdles and both are lots of fun!". 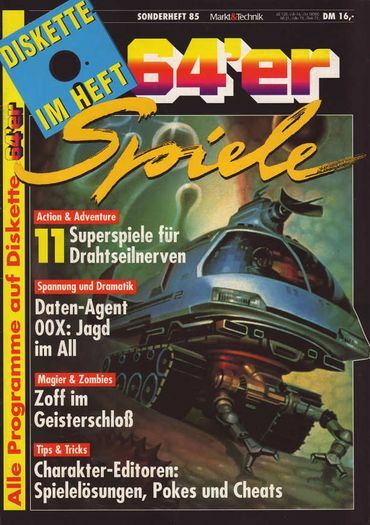 There are several other version of Crillion with different level design, that have never been released officially, but can be found on C64Games.de or Gamebase64.